Certified 14k Yellow Gold Bezel Round Black Diamond Stud Earrings 0.25 ct. tw. These Black diamond stud earrings make a subtle yet trending fashion statement with the .25ctw. Set in the modern bezel setting that is a striking compliment of tones in 14k yellow gold, black diamond earrings are a trending gift. 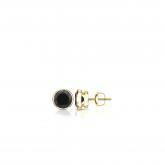 Aavailable with push-back or screw back clasps. Total Carat Weight: 0.25 ct.
Certified 14k Yellow Gold 4-Prong Basket Round Black Diamond Stud Earrings 0.25 ct. tw. 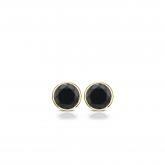 Certified 14k Yellow Gold 3-Prong Martini Round Black Diamond Stud Earrings 0.25 ct. tw.